The shock is still sweeping through Oahu following the revelation that the cost of the rail project is going up by as much as $550 million to $700 million. That sobering news came on Thursday from the officials with the Honolulu Authority for Rapid Transportation. They are scrambling now on a multifaceted plan to deal with the rising costs. A temporary excise tax surcharge — which, when applied to the 4 percent excise tax, actually computes to 4.712 percent — helps pay for most of the $5.2 billion project. So far, that surcharge has collected a little more than $1.3 billion. Even though surcharge collections have generally risen since the surcharge went into effect in 2007, project officials say they are now $41 million short of projections. That triggered the push to extend the tax beyond its expiration date, now to the end of 2022. 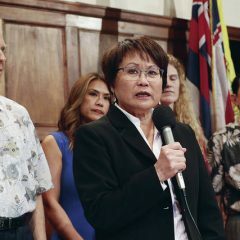 “At the moment, what’s happening is it’s costing every taxpayer $200 a year, and that’s every man, woman and child,” said Tom Yamachika, the president of the Tax Foundation of Hawaii. That is a $200 hit to each person’s wallet, and it adds up when you consider the impact on a family of five. For that family, that’s $1,000 a year, and that has been the impact for the past seven years. Lawmakers promised in 2005 that the rail surcharge would be temporary. The last time state lawmakers talked about a temporary tax was back in 1986. It was the hotel room tax, proceeds of which were meant to help build the Hawaii Convention Center. The center was opened in 1998, and the tax is still with us. 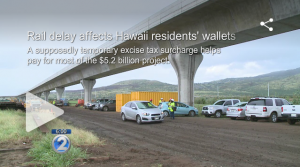 KHON2 asked Joe Souki, Speaker of the State House of Representatives, what the chances are of making the rail tax surcharge permanent. Still, Yamachika remembers the promises made in 1986 with the hotel room tax and 2005 with the rail surcharge. Raising The GET: Will Hawaii Lawmakers Take A Bite Of The Forbidden Fruit?